Bitter Betty Blogs: Tuesday Tip Sheet. Handy habits... Good to have. click to enlarge! 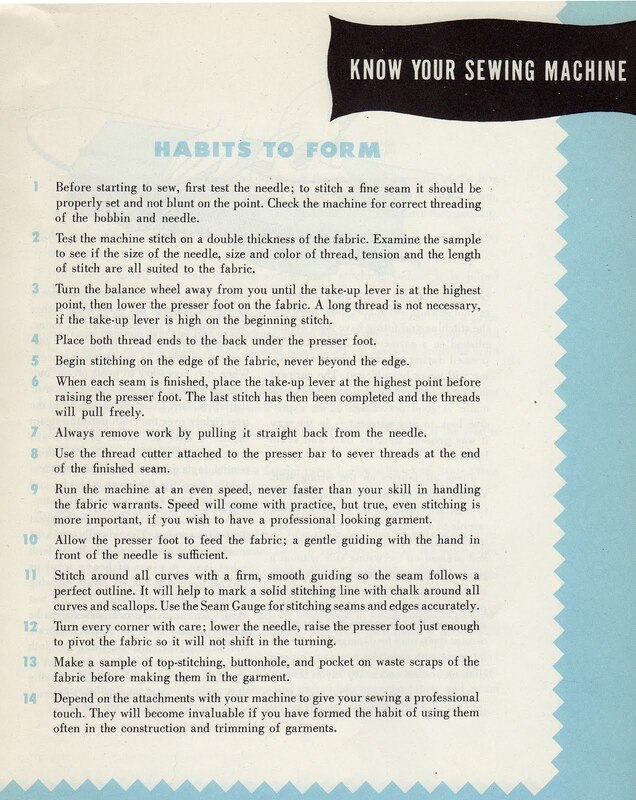 "Know Your Sewing Machine" - this is a timely post. I tried, really I did. Well, actually my sister Lori tried, last weekend. We didn't get to know the old machine that belonged to my mother-in-law. It sat in the closet for, oh, I don't know, 40 years maybe? Couldn't get it threaded correctly, couldn't get thread wound on the shuttle bobbin. I'm afraid we gave up on the ol' gal. Poor thing. She needs a friend like you, I think. If I treated my sewing machine with such care it would think I had been abducted by aliens and replaced! Ohh now I feel guilty for not treating my precious and wonderful tool that I love with better care! I should at least get it serviced once and a while! I really enjoy your tutorials. They refresh and solidify the knowledge that we already have. Besides, since you are sharing it with us, it is fun as well.